There are a few changes since the last update (pencils! ), all explained on this page here. One of the key aspects of sketching is having a range of simple and familiar resources, always accessible. My daily carry is pocket-sized, but has enough variety to meet most demands. The internet’s an amazing resource for researching new tips and methods, so I’d encourage you to experiment until you find the pens etc that help you to sketch as often as possible; if there’s anything in your kit that discourages you from sketching ditch it! This entry was posted in brush pen, coloured paper, inks, kit, Lexington grey, marker pen, pencil, sketching, technique, watercolour sketch, white pen and tagged daily sketch kit, every day carry sketching, home-made palette, inks for urban sketching, Muji card-case palette, pens for sketching, portable urban sketching kit, tiny water-colour palette, water-brush filled with ink. Bookmark the permalink. I always enjoy peeking into your sketch kit! I, too, love the trick of filling waterbrushes with ink. 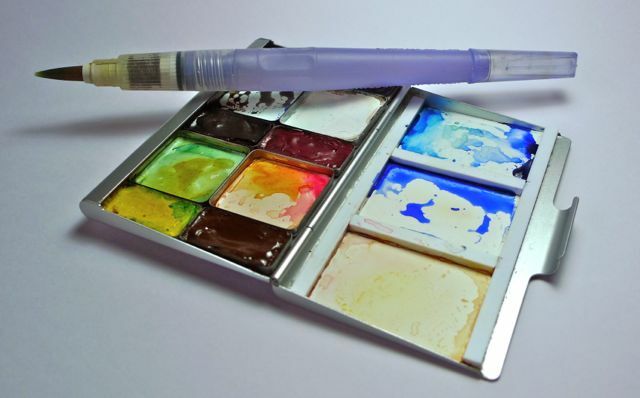 With a careful selection — green for foliage, blue for sky, a warm and a cool gray — I can do without paints in many situations when juggling watercolors would be difficult. Thanks for the peek!